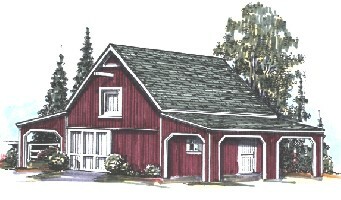 This economical pole-barn has a drive-through bay for parking with 9' high and 10' wide sliding doors front and back. It has a big storage or shop area and two10' x24' shady shelters on the sides. Use the shelters as carports, tractor sheds, run-ins for horses or shady outdoor work areas. Pull-down stairs lead to a 16'x24' storage loft. The plans come with a variety of easy-to-build sheds that you can add across the back for more parking length or extra storage space. Enclosed Floor Area: 480 Sq. Ft., Shelter Area: 480 Sq. Ft., Loft Area: 420 Sq. Ft., Ridge Height: 20'-4"